Never go back-but Jack Reacher does, and the past finally catches up with him. . . . Never Go Back is a novel of action-charged suspense starring "one of the best thriller characters at work today" (Newsweek). Reacher is there to meet-in person-the new commanding officer, Major Susan Turner, so far just a warm, intriguing voice on the phone. But it isn't Turner behind the CO's desk. And Reacher is hit with two pieces of shocking news, one with serious criminal consequences, and one too personal to even think about. 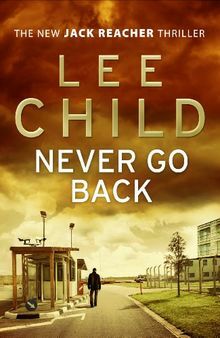 Combining an intricate puzzle of a plot and an exciting chase for truth and justice, Lee Child puts Reacher through his paces-and makes him question who he is, what he's done, and the very future of his untethered life on the open road.